Okay, I’ll be honest I’m a bit of a magpie when it comes to web development, and in particular css frameworks. One week I’ll be telling everyone that’ll listen (which isn’t many people) about how great YUI is, and the next week I’ll be waxing lyrical about the excellent Blueprint framework. So with that little disclaimer out of the way, here’s my take on the rather excellent YAML CSS framework, and my first foray into using it to layout a site. First things first; YAML seems to be very well thought out. It claims to be cross browser compliant in almost every browser that’s still in use by more than one man and his dog, and it fixes most of the major problems web developers run into with the older browsers. Unlike YUI and some of the other Frameworks you’ll need to download the css files etc. and host them yourself. These can all be downloaded from here. 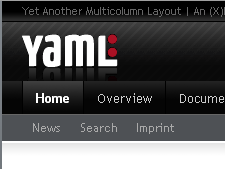 YAML lets you get off to a flying start without any real work creating css reset files etc. After slicing and dicing a design I’ve been working on for a week I managed to get a site up and running cross-browser on the first attempt. This seems to happen very rarely for me. I’ll admit there were a few tweaks here and there to make it perfect, but overall it just worked. It’s got a few default styles that are well thought out and I’m already finding myself duplicating them in other projects I work on that don’t use YAML. I’ll cover details of some of these styles and a bit more on how to use the framework in later posts.